N 53° 50' 03.6" W 008° 22' 11.7"
The two upright stones in the private field. 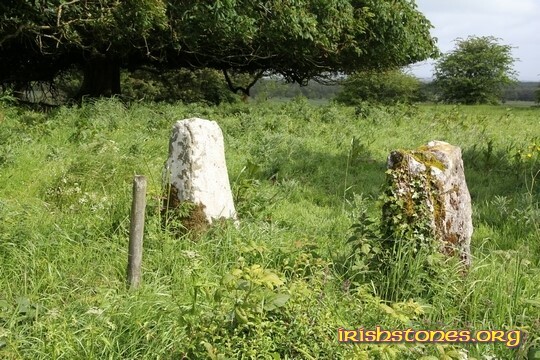 There are three ogham stones at this site, two of them are standing but are in a private field surrounded by a ditch and a double run of barbed wire. The third stone is recumbent on the ground outside the property. It was a Sunday morning, we didn't want to disturb anybody. Only one of the stones seems to have an ogham inscription, unfortunately this is one of the two unreachable stones. All of them have been whitewashed.